Heritage at Kennesaw Mountain offers the popular Cambridge plan priced at $612,613 and provides 5,600 square feet. The Cambridge features six bedrooms and five baths as well as a gourmet kitchen on the main floor of the home. The breakfast room leads outside to a gorgeous patio deck with a screened in option that views a professionally landscaped yard perfect for rest and relaxation. The second story offers three additional bedrooms and a master suite with master bath. The basement also offers a sixth bedroom option as well as a study or game room space. Sterling Walk is a beautiful option in the East Cobb area. In October, the Cameron floor plan will be ready and is priced at $686,415 with 3,606 square feet. Six bedrooms and five baths are located within the home. A spacious gourmet kitchen is located on the main floor along with an oversized island and breakfast area. The family room is lovely and has space to entertain numerous guests. Upstairs, the master suite has his and hers walk-in closets and a master bath and three additional bedrooms. The lower downstairs floor includes many different options such as a game room, additional bedroom option or study. Along with these two communities is another fantastic Ashton Woods Homes community, Belmore Manor. It possesses the sought after Greenville plan priced at $346,479 with 3,169 square feet. With a three car garage, luxurious kitchen, guest retreat and family room, this plan has it all. The second floor provides a master suite and master bath as well as three extra bedrooms and bath. 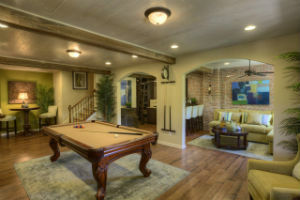 The basement provides options of an extra bedroom, game room and media room. All three communities are near very popular amenities such as Lake Lanier Island Resort & Water Park, Marietta Country Club, Tuner Field, Lakewood Amphitheatre, Stone Mountain and Six Flags Over Georgia. Ashton Woods Homes is one of the nation’s largest private home building companies, with operations in Atlanta, Austin, Dallas, Houston, Killeen, Orlando, Phoenix, San Antonio, Sarasota, Raleigh and Tampa. Recently named the #1 Most Trusted Home Builder in America in the Lifestory Research Most Trusted Builders in America Study SM, Ashton Woods is known throughout the industry for building homes with award-winning designs that inspire and offering home buyers a high level of personalization options. Ashton Woods is also the only builder to nationally utilize the Environments for Living Platinum Program, a program that certifies the energy efficient status of its homes. For more information, visit www.ashtonwoodshomes.com. Ashton Woods Homes Atlanta is the Georgia division of the award-winning national private home builder. Close to jobs, schools, shopping and transportation, Ashton Woods Homes Atlanta is a premier choice for new home buyers. Led by Greg Huff, division president for Atlanta, Ashton Woods Homes has received numerous industry honors, including the Atlanta Service Excellence Award from GuildQuality. For more information, visit www.ashtonwoodshomes.com/atlanta.